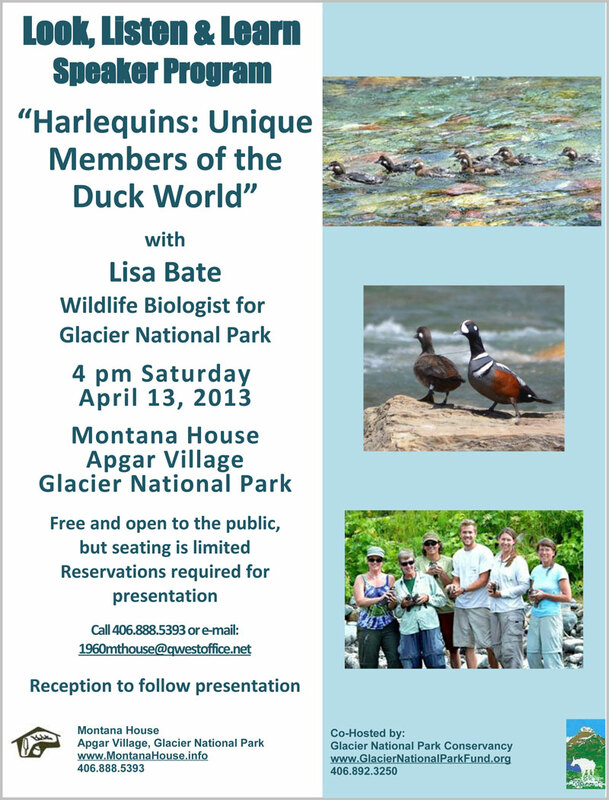 The Montana House and the Glacier National Park Conservancy are pleased to co-host a Look Listen and Learn presentation by Lisa Bate, wildlife biologist for Glacier National Park. The event will be at 4pm Saturday afternoon, April 13th at the Montana House in Apgar Village. 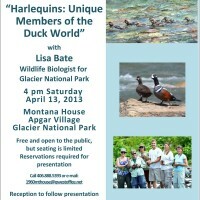 Lisa will discuss current findings of the three-year (2011-2013) Harlequin Duck research project in Glacier National Park. She will share why Harlequins are unique in the duck world, their current status and what more they hope to learn in the final year of the project. Lisa currently oversees the wildlife monitoring program along the Going-to-the-Sun Road during its reconstruction phase, bat and bird monitoring throughout the park, and the GNP research projects on bats and harlequin ducks. Prior to her employment at GNP, Lisa worked as a private research wildlife biologist focusing mainly on cavity-nesting birds and their habitat. The presentation at the Montana House will begin at 4 p.m. with time for questions and a reception to follow. The event is open to the public without charge, but seating is limited, so reservations are needed. Please call 406-888-5393 or email: 1960mthouse@qwestoffice.net for additional information and to reserve your seats.